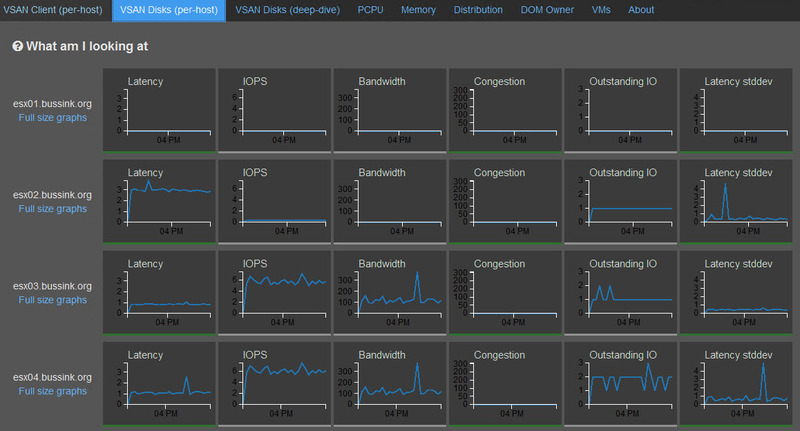 This is just a quick follow-up on my previous “Using VSAN Observer in vCenter 5.5” post. 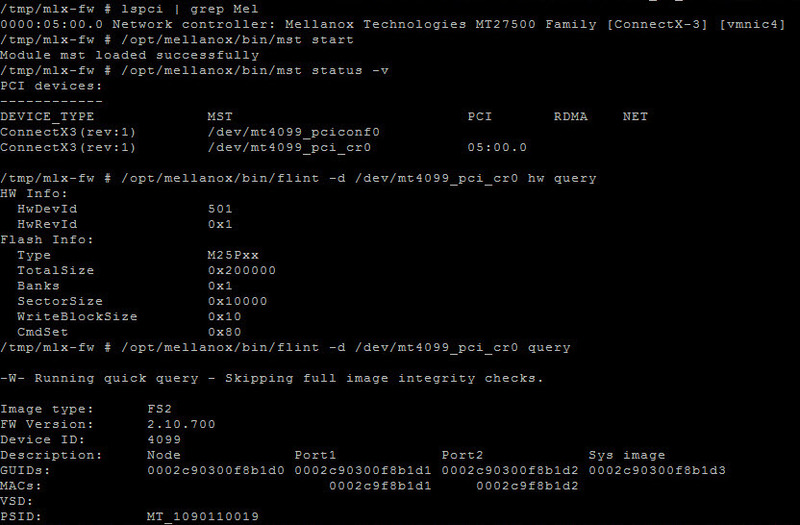 As mentioned recently by Duncan Epping (@DuncanYB) in his blog entry Virtual SAN news flash pt 1. 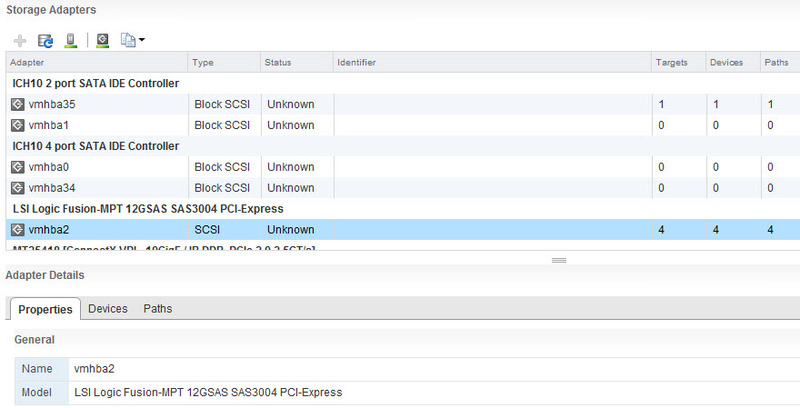 The VSAN engineers have done a full root cause of the AHCI controller issues that have been reported recently. The fix is not out yet. 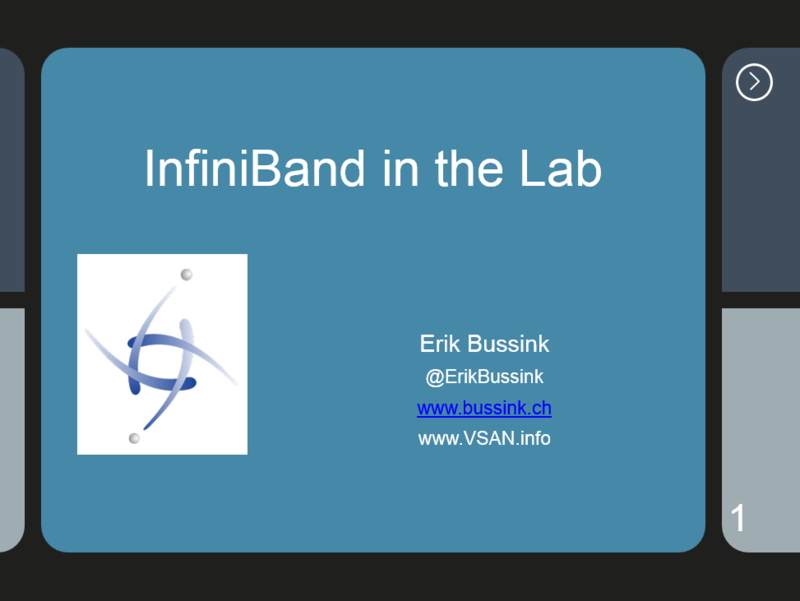 As a precaution, and because I use the AHCI chipset in my homelab servers, I have not scaled up the usage of the VSAN. I have been monitoring closely the VMs I have deployed on the VSAN datastore. This is curious as neither the vSphere Web Client or the vSphere Client on Windows have reported anything at a high level. No Alarms. As can be seen from the following two screenshots. To see any glimpse to an error, you need to drill deeper into the Hard disk to see the following. So what to do in this case. Well I tried to activate the Maintenance Mode and migrate the data from the degraded ESXi host to another. Full data migration: Virtual SAN migrates all data that resides on this host. This option results in the largest amount of data transfer and consumes the most time and resources. Ensure accessibility: Virtual SAN ensures that all virtual machines on this host will remain accessible if the host is shut down or removed from the cluster. Only partial data migration is needed. This is the default option. 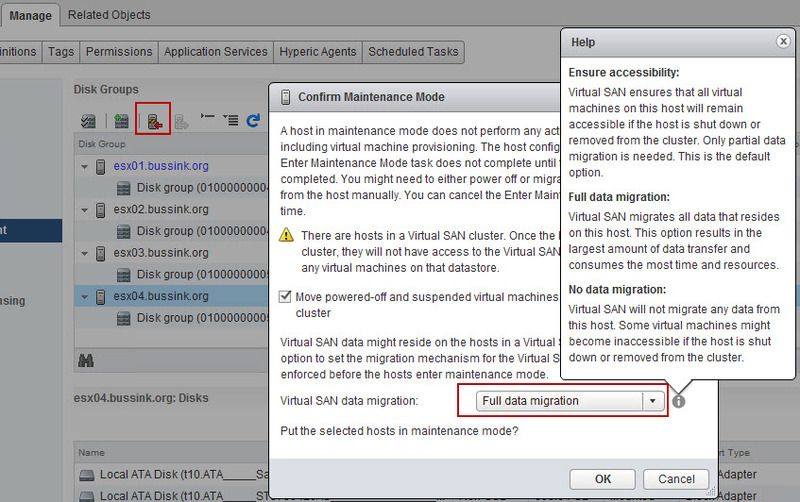 No data migration: Virtual SAN will not migrate any data from this host. Some virtual machines might become inaccessible if the host is shut down or removed from the cluster. So I selected the Full data migration option. But this didn’t work out well for me. I had to fail back to the Ensure accessibility to get the host into maintenance mode. Unfortunately, even after a reboot of the ESXi host and it’s return from maintenance mode. The VSAN Observer keeps telling me that my component residing on the ESXi host is still in a DEGRADED state. Guess, I will have to patiently wait for the release of the AHCI controller VSAN fix. And see how it performs then. Is VSAN Observer picking up some extra info that is not raised by the vCenter Server 5.5 ? Is the info from the vCenter Server 5.5 not presented properly in the vSphere Web Client ? My hosts have two gigabit network interface. I have created two VMkernel-VSAN interface in two differents IP ranges, as per the recommendations. Each VMkernel-VSAN interface goes out using one interface, and will not switch to the 2nd one. “VSAN observer is an experimental feature. 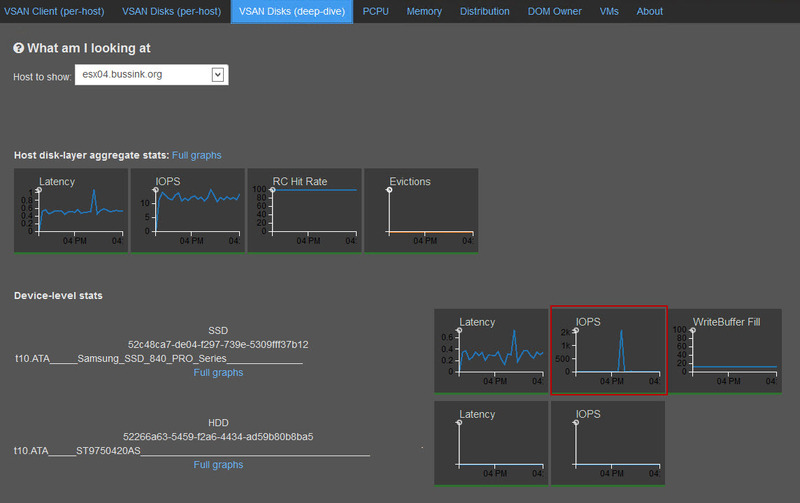 It can be used to understand VSAN performance characteristics and as such is a tool intended for customers who desire deeper insight into VSAN as well as by VMware Support to analyze performance issues encountered in the field.” This is the tool any tester of VSAN can use to monitor his hosts, disks, VMs and see the distribution across hosts. The VSAN Observer runs on the Ruby vSphere Console (RVC). Ruby vSphere Console (RVC) is a Linux console UI for vSphere, built on the RbVmomi bindings to the vSphere API. The vSphere object graph is presented as a virtual filesystem, allowing you to navigate and run commands against managed entities using familiar shell syntax.Your vCenter 5.5 ships with RVC installed. In the vCenter 5.5 server under the path C:\Program Files\VMware\Infrastructure\VirtualCenter Server\support\rvc you will find the rvc.bat file. Edit the rvc.bat file with notepad or notepad++ and jump at the end of the line to change the name of the user that will connect to the vCenter and the name of the vCenter. That can be seen from the output below in the first orange box. Remember that the Ruby vSphere Console and the VSAN Observer tool are an experimental feature. There is no user authentication to the VSAN Observer website, and I’ve found out that the VSAN Observer process dies after a few hours. But the command you want is to launch the vsan.observer program that will launch a webserver to which you can connect on port 8010 (Second orange box). To stop the vsan.observer process you can stop it with a double Ctrl+C. So now that you have your vsan.observer running, let’s connect to it with a browser on port 8010. This is the About section that will list your VSAN hosts. 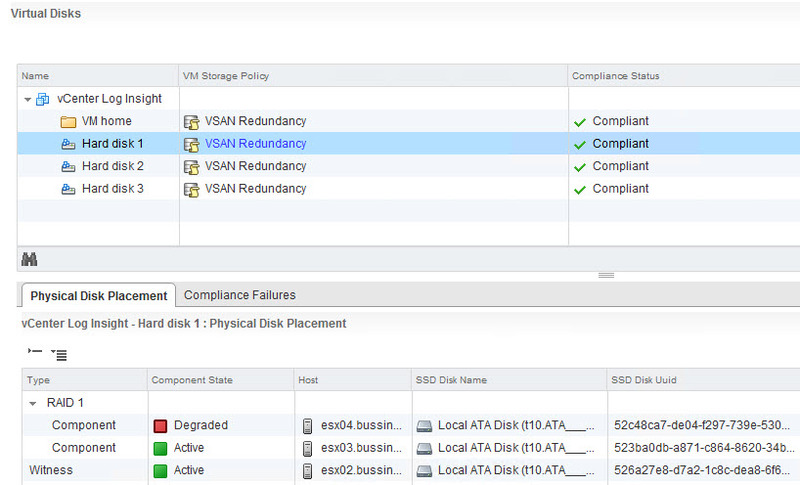 But you can get some very interesting information about your Hosts such as VSAN Disks (per-host). 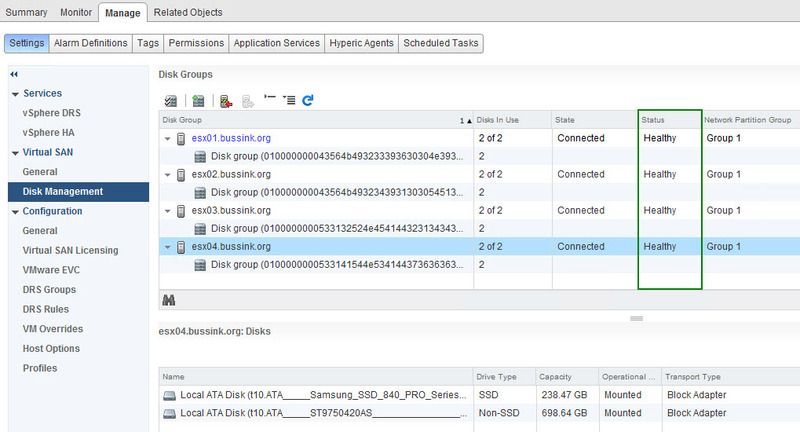 Here is the VSAN Disk (deep-dive) to see the performance of the SSD caching in front of the magnetic disk. Here the vCenter Log Insight appliance kept on the VSAN, had a peak during a reboot. 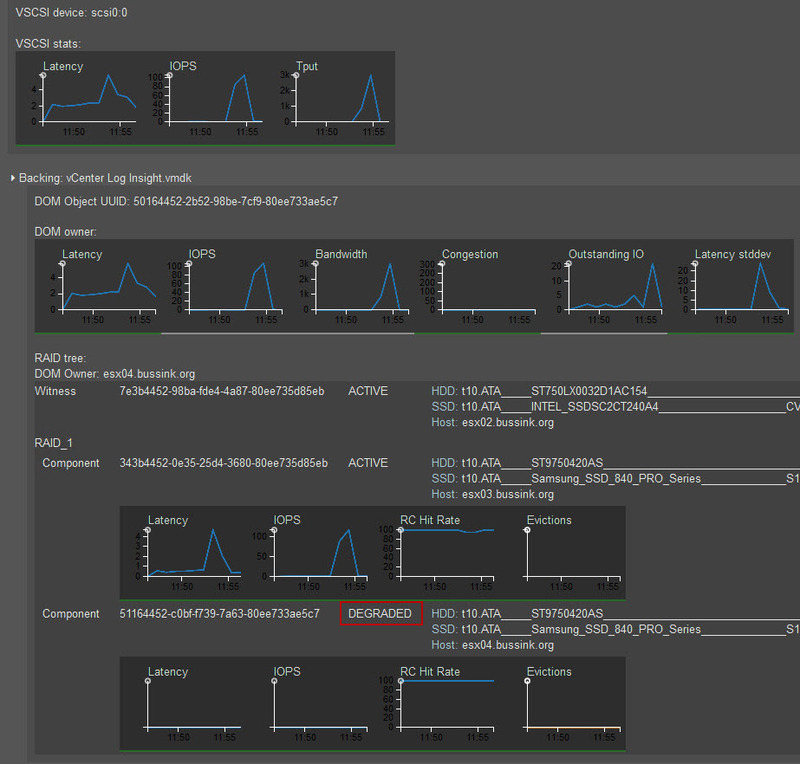 You can also drill deep with the Full graphs to get more details of the write operations on the SSD. These charts are not always the easiest to read. But you will find great stuff here. 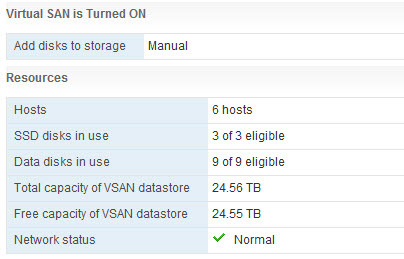 VM VSAN Stats with Backing Storage. The is the most interesting charts I’ve found. 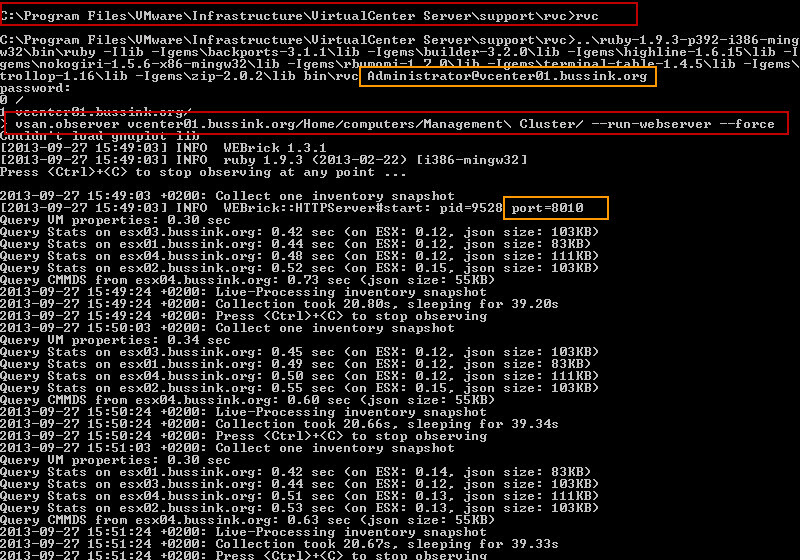 This is where you can see the different component of the storage backing your VM. My Storage Policu for the vCenter Log Insight is placed in the vCenter with a VSAN Redundancy policy (Number of failures to tolerate = 1). I recommend you see this picture in full size, to better see the various details. This below is the original view you get with the vSphere Web Client view from the Monitor, Virtual SAN and on the VM. After having played a bit with the RVC VSAN Observer in the last 24 hours. I think this will be an interesting tool for Storage IO analysis. I really hope this makes it into a Fling or a full plugin for the vCenter server. If your vCenter Server 5.5 is running on a Windows hosts with the integrated firewall activated. Here is the rule to open the port on your system to check the VSAN Observer, from another machine. This is to give you a quick insight in my 2013 Homelab that is running vSphere 5.5 and has a running version of Virtual SAN (VSAN) in Beta code. I have been quiet on the blog for a while, as I’ve been doing some tests with vSphere 5.5 and VSAN, but the NDA has limited my communications. This is probably the smallest VSAN implementation you can do without going with a Nested VSAN (Awesome design by William Lam) or with three Mac Mini’s. That is a lot of storage in such a small case, but it works, and you don’t even hear the ventilator (for Wife Acceptance Factor approval). I’m not going to cover in this article how you need to create a VMkernel interface for VSAN, and that you need to disable HA before turning VSAN on. 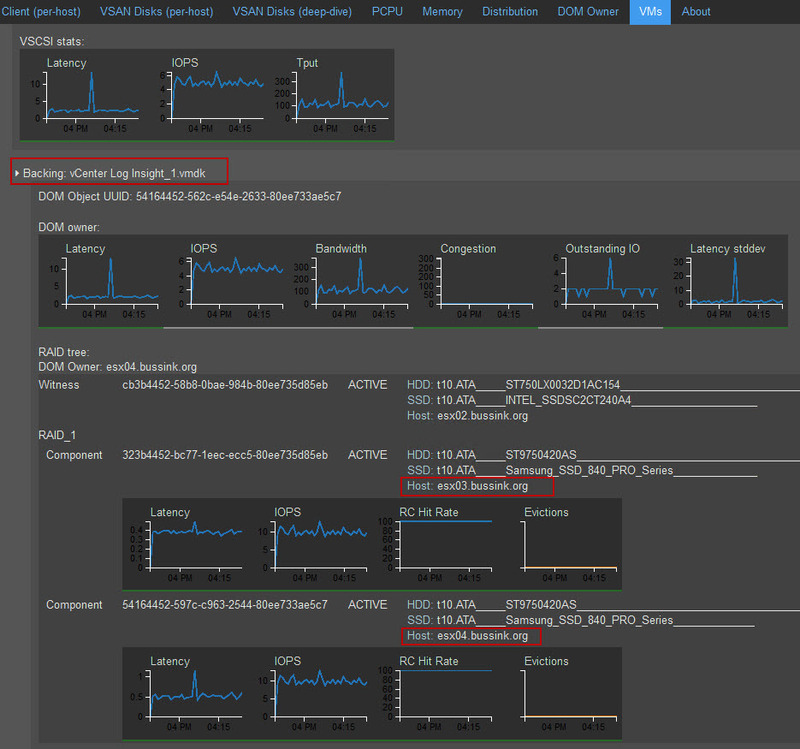 This article “VSAN How to Configure” by David Hill does an excellent job, and his follow-up post “Configure disk redundancy in VSAN” adds more information. 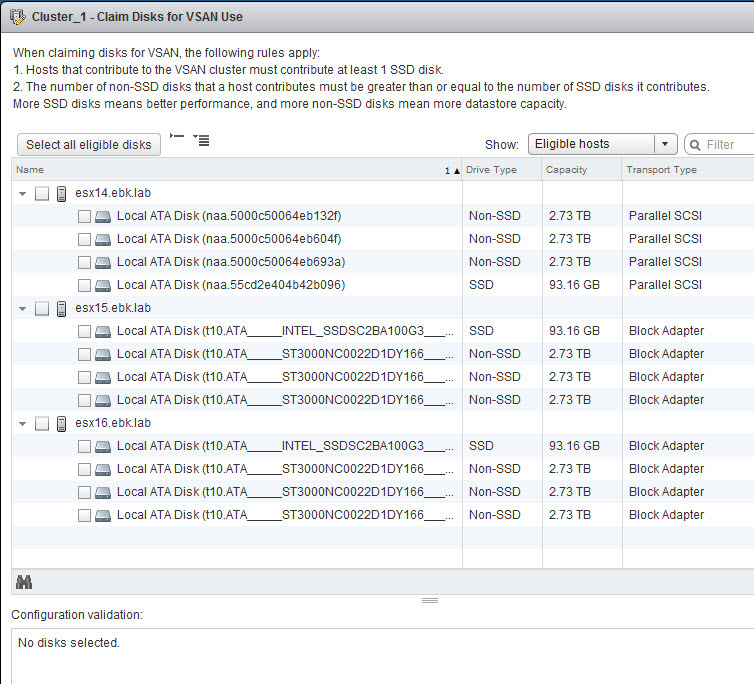 From the vSphere Web Client, this is the configuration of my VSAN after I enabled it. So once you enable the VSAN with three hosts that each have an empty SSD and HD (in my case 240GB SSD and 750GB HD) you get the following. Another great functionality of the VSAN, is that if you take another ESXi host and configure it’s VSAN VMkernel interface and add it to the VSAN Resource, it automaticaly mounts the VSAN Datastore. 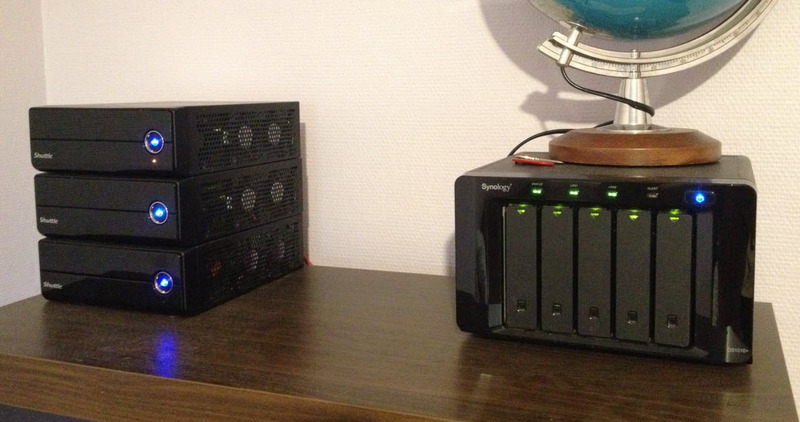 This will greatly simplify the provisioning of storage in a vSphere Cluster. 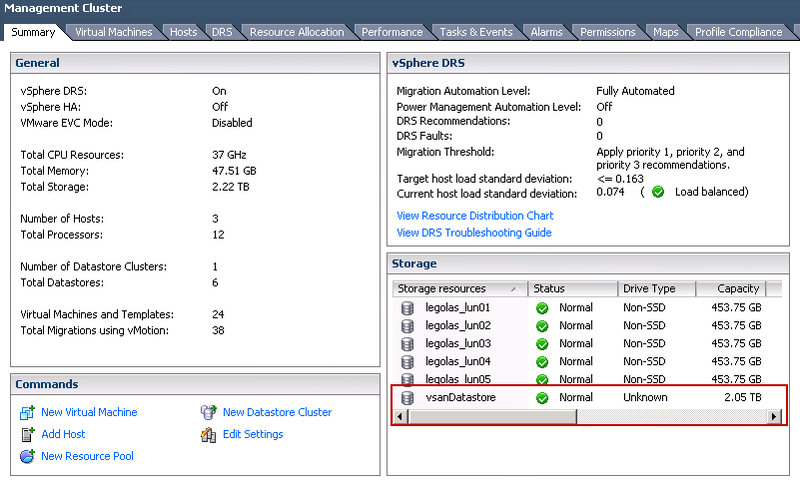 The VSAN Datastore is also the first implementation of Virtual Volumes (VVOL) that I have seen. 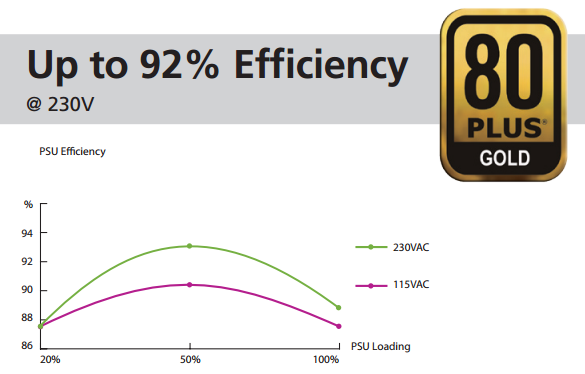 Cormac Hogan has a great Virtual Volume (VVOL) Tech Preview article. The Virtual SAN from VMware should be available in Beta for a wider audience very soon, so go over to VMware VSAN Beta Register. Concerning the Shuttle XH61v, it’s only down side is the two SO-DIMM slots of memory. There is no current capacity to increase beyond the 16GB the memory of a Mini-ITX motherboard. The Shuttle XH61v cannot boot in USB3 mode from the USB key, you need to modify the BIOS and downgrade the USB3 to USB2 mode.